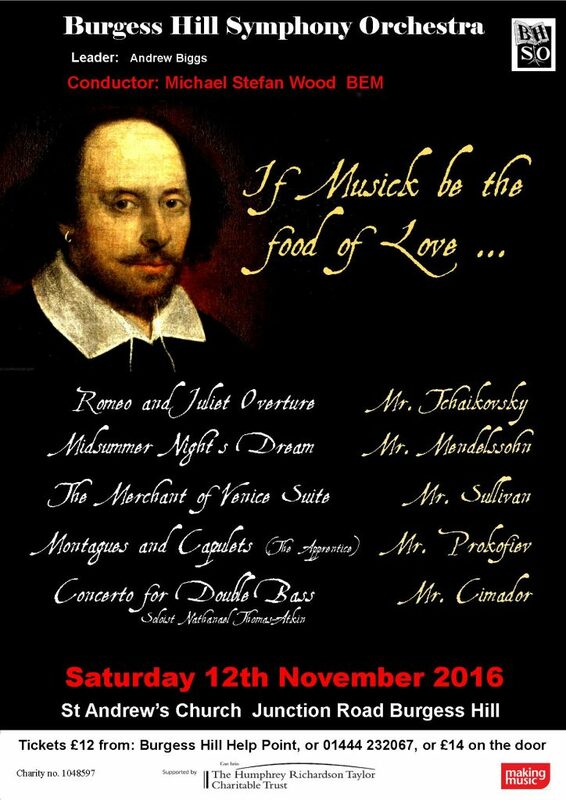 On Saturday 12th November 2016 at 7:30pm Burgess Hill Symphony Orchestra presented their Autumn Concert at St. Andrew’s Church, Junction Road, Burgess Hill, RH15 0LG. This year we commemorate 400 years since the death of William Shakespeare. Led by our ebullient conductor Mike Wood BEM, the orchestra will mark this event with a exciting series of works based on some of his many plays. For this concert, the orchestra gets all romantic in Tchaikovsky’s Romeo and Juliet Overture, while later on impersonating the donkey in Mendellsohn’s Midsummer Night’s Dream! Sullivan’s Merchant of Venice suite is cheeky, buoyant, and full of surprises. It’s not often that you get the chance to hear a double bass concerto in your home town. Our resident double bass player Nathanael, who takes centre stage to perform this for us, is sure to give a stunning performance. Tickets are £14 on the door or £12 for tickets purchased in advance. Accompanied under 16’s free (ticket required). Purchase from the Burgess Hill Help Point, or call 01444 232067, or buy your ticket quickly and easily online at http://www.bhso.org.uk/box-office/.